Necklace making is such a personal expression of your style, and it's one of the reasons why I love making my own beaded jewelry. I definitely have my own sense of style when it comes to fashion, and so do you! You may not realize it, but your choices in bead types and colors are the perfect way to express you own individuality when it comes to your necklace making projects. One of the things I love about Beadwork magazine's Designers of the Year is that each project is a distinct reflection of the artistic sensibilities of the bead artist who designed it. Which of these Designer of the Year necklace making projects best fits your necklace making style? Colorful and cheerful! How can you not love the colors in the Palm Coast Necklace by Sue Jackson and Wendy Hubick? This is the kind of necklace that makes you smile when you catch a glance of it in the mirror, and is sure to brighten the day of anyone who sees you wearing it. Brilliant metallic colors of knitted-wire-covered-ball chain add another fun flair to this joyful necklace making project. Geometric and bold. There's something about the Cosmic Diamonds necklace by Jean Power that makes me think it wouldn't look out of place at an art gallery opening. 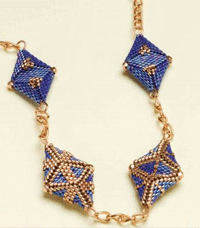 Jean's use of complex geometric forms with those uniformly-sized cylinder beads makes this necklace making project both architectural in its structure and artistic through her use of color. Ethnic and tribal. The Bedouin Amulet necklace by Diane Fitzgerald is an elegant re-creation of a traditional prayer box using peyote stitch. Ethnic and tribal-inspired jewelry is my personal favorite necklace making style. To me, it's a way to learn about and honor global cultures through their traditions of self-adornment. Minimalist and modern. How can you not love the way that Leslie Frazier used this unusual metal chain in her Adorned Chain Necklace? Simple, yet elegant and classy. Who says that beaded necklace projects have to be big and over-the-top to be beautiful? 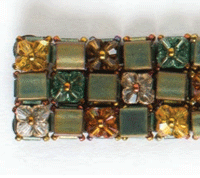 There's an added dimension to this piece of beadwork through Leslie's use of those fun peanut beads. Now, even if you don't like the particular colors of beads used in these necklace making projects, you can change them up to suit your style! Imagine if the colorful Palm Coast necklace was made in just two sleek colors of metallic bronze and silver? 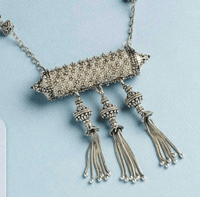 Or if you made the Bedouin Amulet necklace in intense, silver-lined jewel tones, reminiscent of ancient Tibetan Buddhist paintings and weavings? There's an entire world of options for you with these necklace making projects! In addition to the fabulous Designer of the Year projects in each issue of Beadwork magazine, you'll also find great beaded bracelet making and earring making projects that let you express yourself with style. Refine your bead-weaving skills, learn about the latest and greatest beads, beading supplies, and jewelry findings, and be inspired by the work of gifted bead artists. Subscribe to Beadwork magazine and find out how much fun it can be to develop your own personal style with handmade beaded jewelry! So, now it's your turn! What's your favorite necklace making style? Do you prefer the big and the bold? Do you lean towards delicate, yet intricate, beaded chains? Or maybe you're somewhere in the middle? 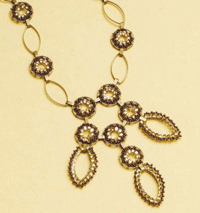 Tell us all about your favorite necklace making style and leave a comment here on the Beading Daily blog!